Good Technical Specifications: This thunderbolt cable adapter is compatible with Thunderbolt 2 or DisplayPort 1.2 devices. Mini DisplayPort to hdmi cable adapter allows you to connect to any Mini DisplayPort-equipped laptop (including the Mac family of products). Mini displayport to displayport cable adapter connects to a HDTV, monitor or projector. This thunderbolt 2 to displayport and hdmi cable to thunderbolt support multi-channel digital audio output devices up to 4K Ultra, full HD and 3D. Converts audio and video to any device display enabled with HDMI technology: This does NOT work with any iPads or 8-Pin lightning devices. No-Installation Required and Top Quality Cable: This cable mini displayport to hdmi does not need any software. You can use adapter mini displayport to hdmi cable after taking it out from the box. The cable hdmi to mini displayport, is built with quality cable. Mdp to hdmi adapter has molded strain relief design. Hdmi female to displayport cable ensures superior flex life. Displayport male to hdmi cable has tensile strength. This hdmi cable mini adapter is made with the finest cable materials. Compatibility Options: This mini display to hdmi adapter works to improve the accuracy, speed of work flow. However, it does not work with iPhones and iPads or any other Apple devices. 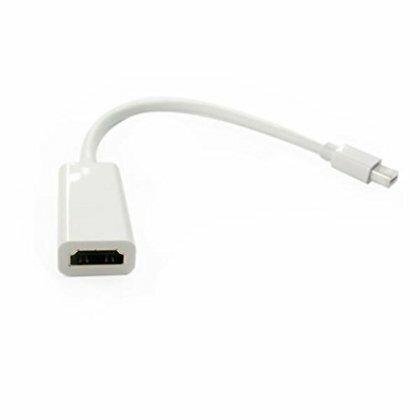 This thunderbolt to displayport adapter and displayport adapter cable works only in Mac Books and other computers. It works best as dell displayport to hdmi adapter, asus display port adapter, surface 2 / 3 / 4 pro hdmi adapter, windows mini pc hdmi, hdmi cable for macbook pro, video cable for surface pro 4, etc. Cost-effective: This video adapter to hdmi gives you support to stream monitor. This hdmi cable mini displayport adapter provides the best audio optional support. They could be connected as cable mini displayport to hdmi apple, lenovo hdmi cable, hdmi adapter microsoft, mini displayport to hdmi cable for surface pro 3 etc. This state of the art hdmi mini displayport cable and mini displayport cable apple from Mobi Lock would never get you wrong. Thunderbolt displayport to hdmi is cost-effective.